If you ever visit a bank and do some financial transaction, you would notice that bank employee would note the information about the transaction in some format (paper based or electronic based). In the same way for SQL Server logging of transaction is needed. Hence, transaction log (also known as T-Log) file is an integral part of database. For the RDBMS to be durable, logging of transaction is done before making any modification. 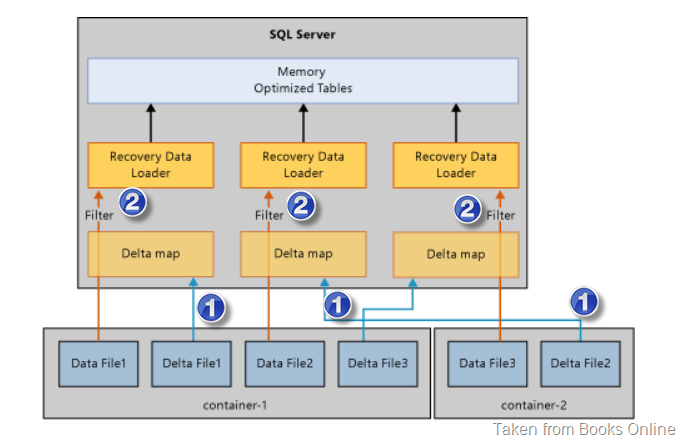 If an in-memory table is defined as “durable” then logging has to be done for the table. The logging of transaction is done differently for in-memory tables and that’s why I am dedicating a blog post only on this topic in A-Z Series. Multiple changes in table are merged into single log record. Log records are not generated for any modification of Index. The index on the table is rebuild during startup of the database. Transaction log records are written only if the transaction on in-memory table is committed. This would mean that no UNDO information would be logged. Due to all above, the amount of information logged into transaction log is less and also efficient as compared to disk based tables. This makes in-memory OLTP scalable and high performance engine. Let’s understand each point by demo(s). 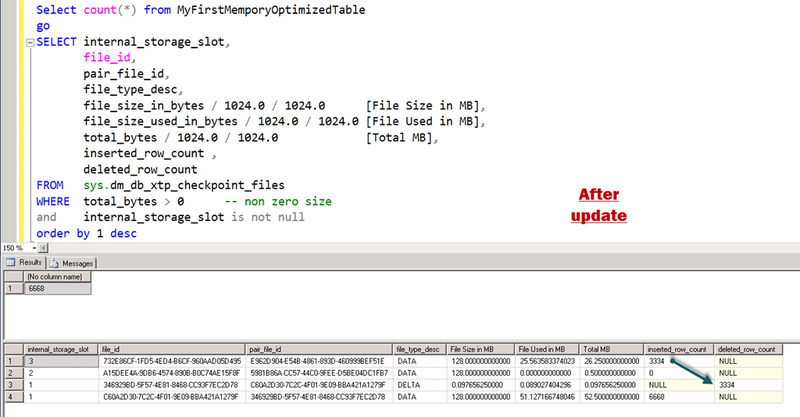 To check this behavior, we could create two identical tables – Disk based and In-Memory table. Here is the script which can be used. This is the same script which you might have seen earlier in this blog. Now, I am going to insert 100 rows in Disk based table. As shown below, we can see 200 rows for our table (DiskBasedTable). LOP_INSERT_ROWS operation is logged for HEAP and INDEX. Since we have inserted 100 rows, it has caused 200 log records i.e. two per row. In Operation column – LOP stands for logical operation. Above query shows output as 26000= ~25 KB. 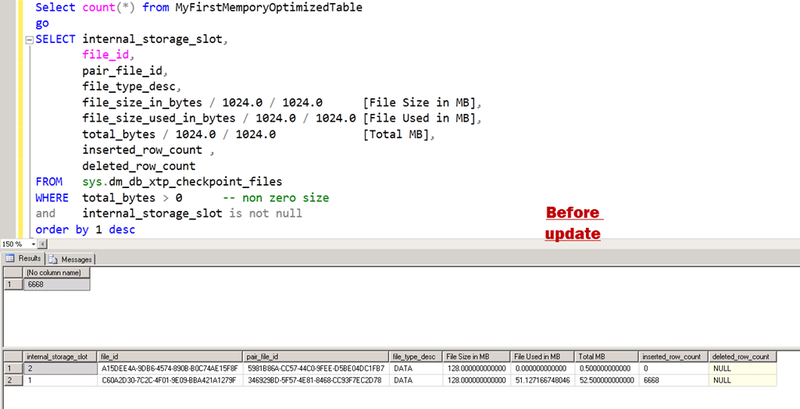 Now, we will do the same insert operation for in-memory table (MyFirstMemporyOptimizedTable) and look at log records. Let’s examine log records for this operation. I am showing only top 3 records which are relevant for our discussion. As we can see above that we have total three log records for 100 rows inserted. Have a look at length of the LOP_HK log record, its ~6 KB. We can use another undocumented function fn_dblog_xtp to crack-open that record. HK in the operation column is the artifact of feature’s code name Hekaton. Top and bottom (Row # 1 and Row # 102) rows are HK_LOP_BEGIN_TX and HK_LOP_COMMIT_TX. HK_LOP_INSERT_ROW is seen 100 times. Above proves the concept that amount of data logged for in-memory table is lesser as compared to disk-based tables. In last screenshot, we can see that we don’t have any log records which contains information about index modification as oppose to disk-based table where we saw LCK_INDEX_LEAF. For In-Memory OLTP transactions, log records are generated only at commit time. As oppose to disk-based table, in-memory OLTP doesn’t follow write-ahead logging (WAL) protocol. Not using WAL protocol makes it highly efficient. To prove this point, we would create a transaction and roll it back. 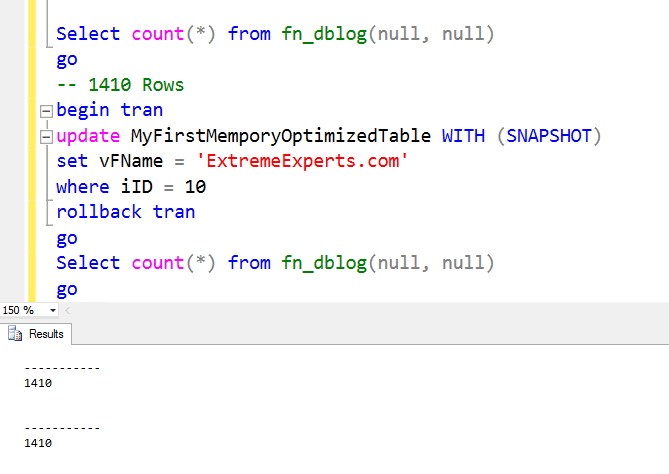 We would again use fn_dblog and count the number of rows. Below is an update which was rolled back and it has generated 4 log records. LOP_BEGIN_XACT stands for begin transaction and LOP_ABORT_XACT stands for rollback/abort of transaction. Now, let’s do the same operation for in-memory table. Before and after rows in transaction log file is same (i.e. 1410) which means no additional rows are generated for a uncommitted transaction, if it’s done for in-memory table. I hope that now you are clear about the difference in logging. In summary, we can say that logging of transaction on in-memory table is much more efficient as compare to disk based table transactions logging. Stay tuned for more on Hekaton.